Impression, Sunrise is a slight sketch, almost certainly completed on the spot in a single sitting, depicting the harbour at Le Havre as the sun rises over the cranes, derricks and masts of the anchored ships. 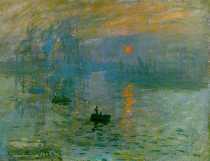 It was actually painted in one sitting by Monet, standing at a window overlooking the harbour at sunrise. The only evidence of life is the lazy action of the oarsman in the most sharply defined part of the composition. The painting gives a suggestion of the early morning mist, at that time clogged with the industrial smoke of the city, and has a strong relationship to the earlier views of mist and fog done by the artist in London in 1870. Influenced by both Eugene Boudin (1824-98) and Johan Barthold Jongkind (1819-1891), Monet had only recently returned from London, and his abiding impression of the city, recalled later, was of its fog. While there, he had seen the work of J.M.W. Turner (1775-1851), who is generally thought to have been an important influence on both him and the other Impressionists, and he may also have seen some of the early Nocturnes by his contemporary James Whistler (1834-1903). At this time Monet was still painting scenes of urban and industrial life, though his vision was entirely that of a landscape painter and his interest mainly in the effects of light rather than in any specific architectural features or the social significance of the manifestations of industry. The most obvious characteristic of Impression, Sunrise is its immediacy of execution and the way it captures just one perceived instant. The forceful, clear shape and strong colour of the sun provides the keynote for the work, with the dense, muted pale blue surrounding it providing the opposition of complementary colours which enhances the brilliance of both. The dark note of the nearest boat identifies and stabilizes the colour key, the darkest element in the whole painting being the single near-black accented horizontal defining the waterline. With the passage of time, underpainting sometimes begins to come through, and here we can see some early drawing in the lower left- and right-hand areas, further evidence of the urgency and immediacy of the painting. The colour character of this painting relies on the opposition of complementaries or near complementaries - orange and blue. In the top left a brown (a mixture of the same orange and blue) gives a linking colour note. The composition, though simple, like that of most Impressionist paintings, is nevertheless dramatically effective. The indistinct forms of the port run across the canvas, and a diagonal from the left edge through the three small boats emphasizes the positioning of the orange sun, while the middle small boat repeats the sun's position in the alternative quarter. The effect is a dynamic balance in which the reflection of the sun in the water enlivens the scene.  Women in the Garden (1866-7) Musee d'Orsay, Paris. Exquisite plein-air painting of water and people.  The Beach at Trouville (1870) Wadsworth Atheneum, CT. Rapid oil painting showing complete mastery of outdoor work.  Poppy Field (Argenteuil) (1873) Musee d'Orsay, Paris. One of a series of paintings of the station.  Water Lilies series (1897-1926) various art museums. Monet painted more than 250 landscapes of his water garden at Giverny. One of a series of eighteen views of Monet's Japanese style bridge. We gratefully acknowledge the use of material from MONET (2002) by Trewin Copplestone, an essential read for anyone interested in the history of painting.  For the meaning of other Impressionist landscapes, see: Homepage.